Villa Castollini overlooks the sparkling Knysna Lagoon from one of the majestic 'Knysna Heads'. Situated on one of the spectacular Knysna Heads is the Tuscan-style, luxurious Villa Castollini. This magnificent villa is only 12km from Knysna and boasts breathtaking views of the estuary by day, while the lights of Knysna create a fairytale wonderland by night. Exceptional service, style and luxury make it an ideal four star base for a South African tour of the Garden Route. All the rooms and suites have en suite bathrooms. The rooms are equipped with DSTV, telephones, a hair dryer, an electronic safe and air-conditioning. The suites also have, as an added bonus, mini-bars and DVD players. Villa Castollini serves both English as well as continental breakfasts. Dinners are only on offer by prior arrangement. The kitchen and dining area is open plan, so you can enjoy watching the preparation of your food and smell the mouth-watering flavors from the kitchen. The dining room flows into the lounge area, where you may relax with a book or with a couple of friends. The Ferrari Room is a bar with a stylish, yet relaxed atmosphere where guests may unwind or socialize. 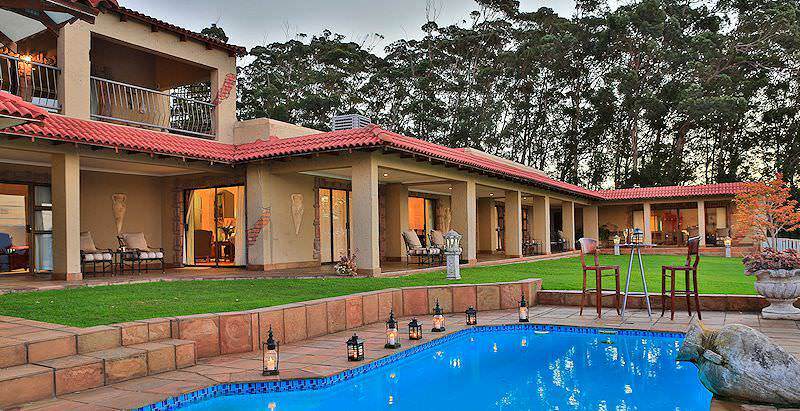 Villa Castollini offers exceptional four star accommodation in Knysna. This guest house has a splendid setting and offers great personal service. Clients of African Sky have stayed at this guest house on tours to South Africa&apos;s Garden Route region for a period spanning many years. The feedback I have received from these clients and the guides who accompanied them has been invariably positive. Personally, I would much rather stay at Villa Castollini than in one of the four star hotels in the town of Knysna. South Africa is affectionately known as 'the world in one country'. Travel to Botswana for the African safari experience of a lifetime. Namibia travel is characterized by unique desert-oriented pursuits. Zambia's appeal lies in its barely touched, remote wilderness areas. Travel to Zimbabwe for a spectacular perspective of the Victoria Falls. Travel to Mozambique for a truly unforgettable African beach vacation. The Kruger National Park is South Africa's largest and most important conservation area, boasting extraordinary diversity. The Sabi Sand Private Game Reserve is a haven for Africa's legendary Big Five and a wealth of other animals. Cape Town is flush with opportunities for both adventure and leisure, from unwinding on Clifton's beaches to climbing Table Mountain. The Garden Route is a paradise for outdoor enthusiasts, covered in lush forests and sporting a stunning collection of freshwater lakes.